EUROPE: Recent project updates from the Wikinger, Borkum Riffgrund 2 and Sandbank projects in Germany; and the UK's EOWDC, Galloper, East Anglia One and Burbo Bank Extension sites. Foundation delivery: Navantia has begun delivery of 29 jacket foundations for Wikinger. They have been manufactured by Navantia and Windar, at the Spanish port of Fene. Confirmed deal: Having previously been appointed preferred contractor, Royal Boskalis Westminster has been awarded the offshore balance of plant contract for the construction of the European Offshore Wind Deployment Centre (EOWDC), by Vattenfall. The €100m contract includes all the offshore elements, with the exception of turbine supply. Boskalis' subsidiary, VBMS, will install the 66kV inter-array and export cables. Radar help: Air traffic services company, NATS, will provide radar mitigation services for the European Offshore Wind Deployment Centre (EOWDC). 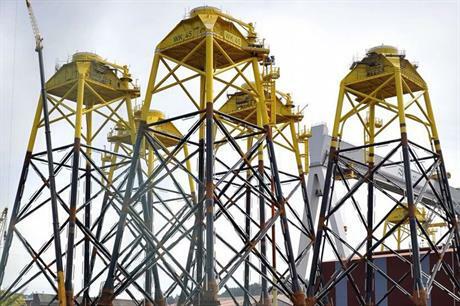 Transmission supply: Dong Energy has awarded Siemens a contract to supply the gas-insulated high voltage switchgear for Borkum Riffgrund 2's offshore substation. Project stake: Japanese investment firm Sumitomo Corporation is to invest in Galloper. It will indirectly acquire a 12.5% stake in the 336MW project, with the transaction due to be completed in the coming months. RWE Innogy UK, Siemens Financial Services, the UK Green Investment Bank and Macquarie Capital achieved financial close for the £1.5bn project in October 2015. Installation begins: Turbine installation is under way at Sandbank and the first of the 72 SWT-4.0-130 turbines is in place. The MPI Adventure installation vessel is being deployed at the North Sea project site, 90km west of Sylt. Safety support: ScottishPower Renewables has awarded SeaRoc Group a five-year framework contract to provide health, safety and quality management support to East Anglia One. The scope of work includes the provision of specialist personnel during construction, the development of management systems and the delivery of comprehensive training. Vessel preparation: A2Sea's Sea Installer jack-up vessel is mobilising in Liverpool, ahead of its turbine installation assignment at Dong Energy's Burbo Bank Extension. Installation of the 32 MHI Vestas V164 8MW turbines is due to commence in September, with completion due by December.